How Far is NCC Urban Gardenia? NCC Urban Gardenia is an ultra-premium residential community set on 4-acres of lushness across two elegantly planned blocks, each with two high rises. Home to top-notch exclusive 4 BHK Spacious Apartments and 5 BHK duplex apartments, the community nestles 184 neighborhoods in all. Each 4 BHK apartment stretches to a magnanimous 3347 sft of space, while the 5 BHK duplex home is an expanse that measures a massive 4152 sft. 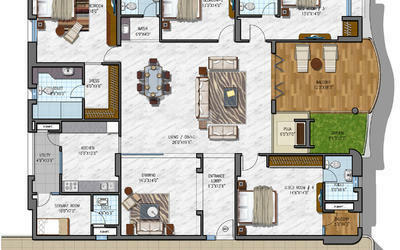 The best is, each of these face East, West and North with all homes designed 100% as per the tenets of Vaastu. The club at Gardenia is one of the most complete of its kind and includes a, Terrace pool at the clubhouse and other at the community, Indoor games like Billiards and Table Tennis and much more. Other pampering facilities include landscaped walk-ways, gymnasium, yoga room, as well as outdoor children's play areas. Unlike other homes, NCC Urban Gardenia is abundant with greenery, so you wake up to and retire for the day with plentiful quantities of fresh air. And while you’re well being is attended to by the nature, the verdant greenery also complements topographical and environmental balance. So while that’s that, the unique architecture of NCC Urban Gardenia enables you to relish a view of the central courtyard and the swimming pool. With a plethora of world-standard amenities and features, your home at the Gardenia will be nothing less than an address the world aspires to own. And take our word - NCC Urban Gardenia has got no less of anything. It’s almost like living in a resort. Beyond that, it’s more like a self-sustained Luxury should always come accompanied by leisure, comfort and a whole lot of pampering. world of environmentally-balanced community, offering you a whole lot of leisure and pleasure you’ll perennially want to stay escaped into. Landscaped gardens all around the building. Swimming pool with conjoined toddler’s pool. Indoor games like Billiards and Table tennis. Outdoor games like Tennis court and Badminton court. 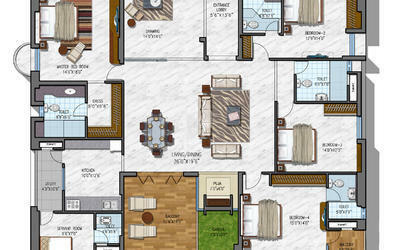 All flats with servant quarters. First time it’s kind of ceiling height 10'6". Cement Concrete block masonry in cement mortar. INTERNAL – Cement mortar plaster with smooth finish. EXTERNAL – Cement mortar plaster with smooth finish. MAIN DOOR – Teak Wooden frame/Machine made frames & Shutter aesthetically designer with melamine polishing and hardware of reputed make. INTERNAL DOORS – Teak Wooden frame/Machine made frame with designer flush shutters with veneer with melamine polished and hardware of reputed make. FRENCH DOORS – UPVC French door with glass. WINDOWS – UPVC glazed windows. INTERNAL –Paint with Acrylic emulsion paint of premium quality. DRAWING, DINING & LIVING – Double charged Vitrified Tiles of premium quality - size 3/3 with 4” skirting. BED ROOMS – Double charged Vitrified Tiles of premium quality - size 2/2 with 4” skirting. KITCHEN – Vitrified Tiles of premium quality - Min size 2/2 with 4” skirting. TOILETS – Anti skid Ceramic tiles Dado up to ceiling height. KITCHEN – Glazed Ceramic Tiles dado up to 2'0" height above the kitchen platform. KITCHEN PLATFORM – Granite Platform with Double bowl & Single drain SS sink with water connection, Provision for Exhaust fan & chimney, Provision for fixing of water purifier, CP sink mixer of Kohler/Equivalent make. ELECTRICALS – Concealed Copper Wiring standard make. c) Power plug for Cooking range, Chimney, Refrigerator, Micro wave Ovens, mixture / grinder in kitchen. g) Switches of Legrand or equivalent make. FTH with Wi-Fi Internet DTH, Telephone & Intercom and Provision for cable connection in living room and all bed rooms. Supply of gas from centralised Gas bank to all individual flats with Pre paid gas meters. One Remote Control – Wi-Fi Touch Screen with Router – It is the Back bone of the Automation System with Expandable/ Upgradable Option. NCC Urban Infrastructure Ltd. is a Subsidiary of NCC Limited and comes Equipped With a world class building techniques and state-of-the-art building infrastructure that is expertly commandeered by top-notch professionals. NCC Urban Infrastructure has created some best in town projects such as NCC Urban Templetrees which offers 2 & 3BHK flats for sale in Keelkattlai, Chennai. The builder is active around Chennai, Bangalore, Hyderabad. Nagarjuna Meadows II one of the projects in Bangalore offers ready to occupy 3BHK apartments for sale in Yelahanka, Bangalore. Developing projects in Hyderabad also has created some prestigious projects like NCC Urban One which offers 3 & 4BHK apartments for sale in Narsingi, Hyderabdad. 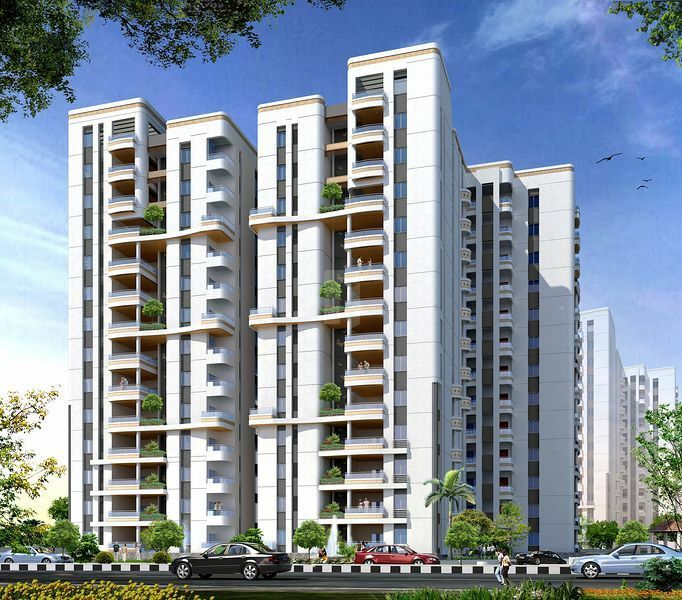 NCC Urban Gardenia one of the luxurious projects developed in Hyderabad offers spacious 4 & 5 BHK apartments for sale in Hitech City, Hyderabad. NCC Urban has inherited its experience and expertise from NCC Limited. Known for its excellence in the execution of Turn key projects, Industrial Buildings, Multi-storeyed, Commercial structures, Townships, Roads, Bridges, Pipelines etc. and rated as growing Infrastructure Company in India with annual turnover nearly Rs. 8,200 crores. NCC Urban is developing the prestigious National Games Housing Complex Project in Ranchi, Jharkhand. The Company has also acquired lands in and around Bengaluru, Chennai, Goa, Gurgaon, Hyderabad, Kakinada, Lucknow, Raipur and Vizag for its Real Estate projects. NCC Urban is all set to deliver 12.8 million sq. ft of built up area spread over 286 acres in the next three years. Everyone at NCC Urban is accountable for health, safety and environment (HS&E) and we work hard to foster a culture where these three factors are considered wherever we operate.